By Simon Johnson and James Kwak, authors of 13 Bankers: The Wall Street Takeover and the Next Financial Meltdown (Pantheon, 2010). The number of important people expressing serious concern about financial institutions that are too big or too complex to fail continues to increase. Since last fall, many leading central bankers including Mervyn King, Paul Volcker, Richard Fisher, and Thomas Hoenig have come out in favor of either breaking up large banks or constraining their activities in ways that reduce taxpayers’ exposure to potential failures. Senators Bernie Sanders and Ted Kaufman have also called for cutting large banks down to a size where they no longer pose a systemic threat to the financial system and the economy. Don’t get us wrong: we think that increased capital requirements are an important and valuable step toward ensuring a safer financial system. We just don’t think they are enough. Nor are they the central issue. One problem is the question of where to set the capital requirements. The administration has proposed increasing capital requirements for the largest firms; because they are too big to fail, it is especially important that they be safe. But this requires knowing how much capital would be needed to withstand what used to be regarded as a relatively financial storm–a “tail event”–which is something that no economist should feel comfortable estimating today, given that such storms may have become more frequent. We believe it would be simpler to have a standard capital requirement for all banks, and make sure that none of those banks are too big to fail. Another problem is how they will be set and enforced. The Treasury Department says that bank regulators already have the power to increase capital requirements, but they will do so as part of an international agreement that they hope to reach by the end of this year. (Current capital requirements are generally based on an existing international accord.) But because capital requirements are enforced by regulatory agencies, which have the power to overlook shortfalls on a case-by-case basis (called “regulatory forbearance”), they can be an unreliable instrument during an economic boom, when regulators are infected by enthusiasm wafting in from the financial markets, if not by the more sinister problem of regulatory capture. Third, there is the problem that capital requirements, like all complex calculations, can be gamed. Lehman Brothers, for example, was more than adequately capitalized on paper–Tier 1 capital of 11.6 percent–shortly before it went bankrupt in September 2008. Thanks to the literally voluminous report by the Lehman bankruptcy examiner, we now know this was in part due to aggressive and misleading accounting. More generally, rampant use of regulatory arbitrage–techniques to artificially increase bank capital ratios–was a factor in the failure of AIG (much of whose business was enabling European banks essentially to evade capital requirements) and the near-failure of Citigroup (which was almost capsized by the structured investment vehicles it created to evade capital requirements). Capital requirements alone are not a reliable tool for preventing the collapse of systemically important financial institutions. Like other regulatory refinements, they depend on the ability and motivation of regulators to rein in financial institutions that have clear incentives to evade them at every opportunity. They also fundamentally reflect the belief that we are smart enough to prevent large financial institutions from collapsing in future financial crises. And the critical underlying assumption is that we will never again have a president in the United States who seeks to deregulate everything in sight; such an assumption would be unrealistic and dangerous. We think the better solution is the “dumber” one: avoid having banks that are too big (or too complex) to fail in the first place. 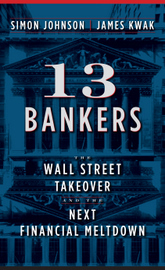 In our book, 13 Bankers, we propose strict asset caps (as a percent of GDP, i.e., relative to the size our overall economy) on financial institutions that are adjusted for the types of assets and obligations held by those institutions – if they want to take more risk, they need to be smaller. We cannot predict what kind of trouble the next generation of bankers will be able to concoct for themselves. But we can try to make sure that when it does happen, we can let them fail without having to bail them out with taxpayer money. An edited version of this article appeared this morning on the NYT’s Economix; it is republished here with permission. If you would like to reproduce the entire post, please contact the New York Times. I discussed the issue of how capital ratios can be “gamed” by banks quite easily on my blog. In fact using the CAMELS indicators which regulators use, Capital is the 4th sign to tip off that the bank has a solvency problem. Earnings and Asset quality will tip off (clue into) problems usually a good 6 months BEFORE you can see problems with Capital in the banks’ “Reports on Condition and Income”. There has been discussion on whether bringing Glass-Steagall back would have an effect on the size of the financial institutions. Reinstating the provisions that prohibit bank holding companies from owning other financial companies. Would this have enough of an effect in breaking the banks up? Jamie Dimon had an op-ed in the WSJ a few weeks back about how financial institutions should be allowed to get as big as they want essentially as long as they are allowed to fail. Do you think a planned breakup of how you would divide the business up similar to a disaster recovery plan in the sense that is on file ready to go when the bank goes under, would this be sufficient enough to allow these institutions to fail without causing major distress within the system? On the contrary higher capital requirements, done correctly, are necessary and sufficient. “Too big too fail” is not sufficient – look at the S&L crisis, where lots of institutions all took the same bet. Systemic crises can still occur with small institutions, because every institution basically makes the same sort of bet anyway. Capital requirements only work if they are done correctly, i.e. cannot be gamed, which you correctly point out can be a problem. “Done correctly” means that it must be regulators who calculate the capital requirements, not leave it up to the banks. And this implies that regulators must understand a banks’ books completely and so not allow a bank to trade products which are too complex to understand. I really don’t see what the big deal is. It should be obvious to even the least informed among us that there is an inherent danger in allowing certain institutions to grow to unnatural sizes. Why the pussyfooting? why the need for all this “analysis” by the administration? Just bring back Glass Stegal. Call it Volcker-Geithner if you want….just separate the commercial banks form the brokerages and investment banks and the problem will be solved. Why reinvent the wheel? Original Basel-II draft had much bigger section on qualitative … in addition to the traditional quantitative risk-adjusted capital … but that got pretty much got eliminated in the reviews over the past decade. More than year ago (anticipating some appetite for such stuff) I had gotten asked to do HTML version of Pecora hearings with lots of cross-references with current situation … but it turned out that there wasn’t the interest that some people thought their might be. Simon – Good Yahoo! Tech Ticker interview. I appreciate your “voice” being “out there.” Thanks for all your effort. While the Depression is depressing me (seriously), your voice provides a little glimmer of hope. you’re doing a great job of spreading the word about the true problem of our banking system in your recent interviews about the book. i would suggest going on John Stewarts Daily Show as well. it really helps when you have an interviewer who is well versed in our situation and who can ask pointed questions as well as expound on the issues. i believe you are creating a ground swell which will eventually work to change the system. Increasing capital requirements is all well and good–but will be futile if nothing is done to remedy the joke these large institutions are allowed to call “accounting.” Call me cynical, but I don’t trust any of Obama’s financial wizards (Geithner, Summers, et al). Weren’t they the bozos in charge when it hit the fan? Now they’re all over reform. Yeah, right. I believe that the idea of capital as a “buffer” is misplaced. Yes, during normal times you raise more capital to keep the flow moving. But, if you are drawing down capital during a significant market event you are most likely going to be insolvent very soon. Instead, capital requirements function more to keep ownership focused on risk by ensuring they will lose significantly when the ship goes down. The problem with this approach is twofold: 1) the moral hazard argument, as the government bails out (without taking capital to zero), incentives to risk behavior actually increases; 2) capital requirements have to be sufficient not from the perspective of the institution but from that of the investor/manager – if my buy-in is low relative to my wealth then I will roll the dice regardless or not spend sufficient attention. So, on the one hand, if institutions are too big, then by design you socialize loss – individuals only have systemic risk, and on the other by raising capital via the markets, the owner/manager’s individual risk position is lowered (dilution works both ways). So, I agree that raising capital requirements does not address the problem, even if the “buffer” is increased (which is fine for normal times). Given the gross distortions in risk/reward that have taken place during this great restructuring, I am not sure that it is clear what the proper ratios are – this is like fine tuning before finishing the engine build (which of course is meant to keep the engine building out of public view). But simply shifting risk to size of institutions is only a start – with leverage and interconnectedness a small set of small institutions can do a lot of harm. We have to go beyond this and ensure that certain types of activities/transactions do not commingle with others – to eliminate risk socialization of private speculative activities. But this is the exact opposite direction in which we are rapidly moving. Seconded – why hasnt this happened already? Even though its a partisan audience, its a big one. Dimon lives in Chicago-‘We freaking perfected extortion, you chumps’. Re: Glass-Steagall, yes it would have this effect. However, we need an “updated” Glass-Steagall, one that declares the shadow banking system (e.g., money market funds, the commercial paper market, and the repo market) to be banks and regulates them as such. We also need to get rid of the off balance sheet fictions by bringing them back onto the balance sheet. This talk about letting big banks fail is LITERAL NONSENSE. It’s like discussing how the government should handle a failing nuclear power plant located in the middle of a populated area, where failing means “about to melt down”. Just think of that analogy anytime some mental midget talks about how we should just let all the big banks fail. You have a point, but I would remind you that the savings and loan crisis was a lot of little banks with insufficient capital that got into trouble. You get closer to the core of the problem when you talk about banks that are too complex to be allowed to fail. Big banks, particularily international ones, often have balance sheets that no one but them really understands. Larger banks seem to bring with them higher information costs for investors and problems with a lack of transparency. Something like the Volker rule or a return to Glass-Steagall seems to be necessary to get us out of this mess. Amazingly Simon Johnson and James Kwak again evidence that they do not understand what really happened and do not possess sufficient knowledge about how the current financial regulations operate so as to have the right to influence the debate. Those who by far are the most responsible for “untrue” capital ratios were and are the regulators. If a bank had 10 million dollars in assets and had lent $ 500 million exclusively to triple-A clients then, traditionally, the bank would report a capital ratio of (10/500) 2 percent. But since the regulators INSTRUCTED the bank to risk-weigh those $ 500 million at only 20 percent they translated these to be only $100 million and duly authorized reported a capital ratio of (10/100) 10%. Again, for the umpteenth time, the biggest problem with the current method of capital requirements for banks is NOT whether they have been set too low or too high but that they have been set differently based on the perceptions of the credit rating agencies. Glass-Steagall is the answer. I used to sit on a Board of Governors of one of the insurance industry’s trade associations. We lived in terror of giving banks the right to sell our insurance on their products. We lobbied and lobbied, but had not sufficient assets or connections to prevent it from happening. It was small and insignificant compared to the banks being allowed to control the market for investments. That is sick. The Clinton-Greenspan-Gramm conspiracy that dismissed Brooksley Born was a travesty of the first degree. Even then, and still today, the government is captured, lock, stock and barrel, by those who want to make billions subverting the world’s economies (and ours with it). Simon, you and James need much more media focus on you. I suggested this yesterday. You all have a habit of appearing on shows with very small audiences (Moyers, NPR, etal). You need to be on Morning Joe, the Daily Show, even Jay Leno. We need the general populace to hear your message and understand it. We are all outraged at what is currently transpiring between the captured Congress, Treasury, the FED, and the Obama Administration (perhaps excepting Volcker). Please find a way onto Meet the Depressed or Deface the Nation, even those have far wider viewerships than most of the places you have been interviewed. Simon, have you seen Andy Haldane’s latest speech, ‘The $100 billion question’? He characteristically frames the debate in a brilliant way. What message? To hate the bankers or how o insure how our savings get re-circulated in the best way for society to go forward? To do that, I would trust the banks a thousand times more than what I would trust a government lending officer named Simon. I understand (I think) the point that you’re trying to make on concentration, size and complexity in US banking. However, if you read it over objectively, you might agree that the above post goes too far in two important ways. But you also seem to ignore the effect of the proposed capital requirements on bank size and concentration. You note that the administration has proposed higher capital requirements for larger firms. You understand that this an attempt to “tax” larger firms. It seems that you have no faith in the ability of such “progressive” reserve requirements to accomplish the same goal that you’re after; reduce concentration in the banking sector. Could you please explain why? This is probably not enough to accomplish what you want to accomplish. You can have a group of entities that are taking the same risks and behaving in the same way. Look at fixed-income arbitrage in 1998, or equity stat arbitrage in 2007: it really didn’t matter whether it was lots of banks or hedge funds making those trades, or a single bank/fund making the trades. They applied the same model and the same thesis to the same assets, so the only real difference was that capitulation was more gradual and less organized. I suspect that the too-big-to-fail paradigm is the wrong one, since it looks at companies, not theses. You can’t create a regulatory framework that prevents people from assuming that real estate always appreciates, or that tech stocks are infinitely valuable, or that we’ll never run out of oil. Done correctly signifies to me the same capital requirements for all assets because it is exactly when regulators get involved into arbitrarily managing for risk that the whole market gets confused and explosions like the current one happens. For you information it was regulators who allowed banks to hold only 1.6 percent in capital when lending to AAA rated corporations and it was regulators who allowed banks to hold no capital at all when lending to AAA rated sovereigns. Regulators cannot understand risk completely… no human can!